Charts this week come courtesy of a trader who contacted me seeking some help. This is something he finds himself doing time and time again. And in my experience he's certainly not alone. This is such a great example. I'm really pleased I can share it. The original images were too large to fit here, so I've included two smaller segments of the larger chart. The market and timeframe have been removed. Examine the charts as if they're your own market and your own timeframe. In case it's not obvious, all trades here are SHORT. STOP FIGHTING AN OBVIOUS MARKET BIAS! If you consistently trade like this you are NOT on the right path. This is not the way to win. And it doesn't always need to be such an extreme trend. All SHORT except for the second last trade. First, gather some chart evidence which highlights the problem. Examine the charts from past sessions. Find as many occurrences as you can which show you fading an obvious market bias… and continuing to do so well beyond when it becomes obvious that it's not working. Print them out and place them in a file. Continue this process in future, with any new sessions that show the same problem occurring again. If you don't have sufficient historical data, start the process in real-time, from now on. Second, gather statistical evidence of the problem. It's not enough to suspect that this is damaging your edge. I want you to get some cold-hard facts to prove it. Your stats don't like. Extract data for all the trades you identified from the first step; at the times when you have identified a problem. From this subset of your full trade data, find the total loss, win percentage and average win vs average loss. Record your stats on the applicable chart, within your "fighting the market bias" file. Third, feel disgust at the results. Examine the charts and their associated stats. Page after page after page. There is no greater motivator for change than disgust. I want you to stare at the evidence showing proof of damage to your edge, and to the charts showing failure after failure, until the point at which your disgust is so great that it leads to decision, desire and resolve to change. Fourth, try to understand the beliefs which lead to this behaviour. While a part of you might know that you shouldn't fade an obvious market bias, there is another part of you that sees this as necessary behaviour. You're not seeking to self-sabotage. Likely, there is some other underlying belief that is driving you to expect a market reversal and to stick to that belief despite all evidence to the contrary. This may be hard, but you need to put yourself into the mindset you were in at the times you were fading the market. What were your expectations or beliefs? Establish procedural checks to catch dangerous behaviour as early as possible. For example, "After two underperforming trades in a row I will step back from the charts and from my beliefs about market expectations, and examine the general direction of the market. Am I fighting an obvious market bias?" Interrupt any edge-destroying behaviour as early as possible. Having identified the beginnings of a potentially dangerous sequence of trades, either stand aside until the market conditions have changed, or implement controls to restrict trading to the market direction only. 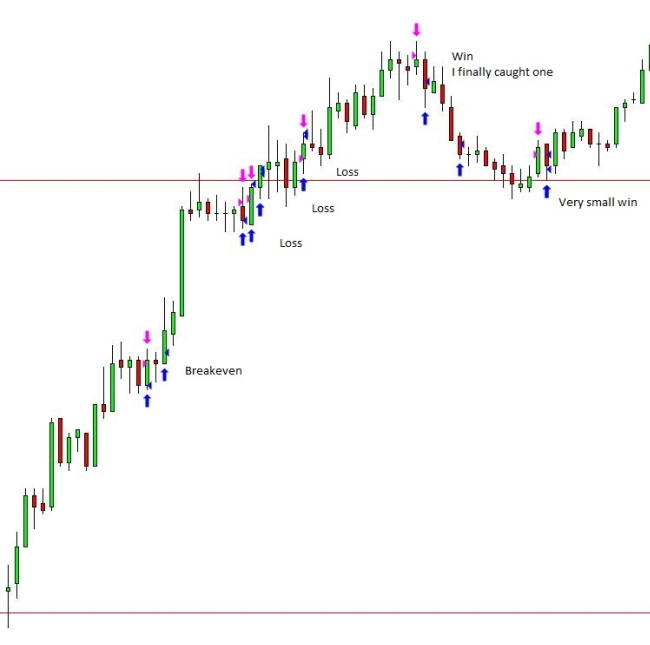 Example of controls: (a) Procedural – Implement a rule such as "I will restrict myself to trading LONG only until a confirmed break of the trading timeframe trend structure. ", (b) Physical – Use hotkeys for entry with buy or sell being on different sides of the keyboard. And then cover the sell side with a sheet of paper! ie. Whatever works!!! If there is ever conflict between your beliefs and the objective reality of market movement, trust the market. Sixth, approach new sessions with a better belief system. Before trading, remind yourself of the potential damage to your edge that comes from fading an obvious market bias. Flick through some pages of your "fighting the market bias" file. Remind yourself of the disgust at this past behaviour and of your resolve to limit its recurrence in future. Consider the use of visualisation. Picture yourself operating the checks and controls as determined above. 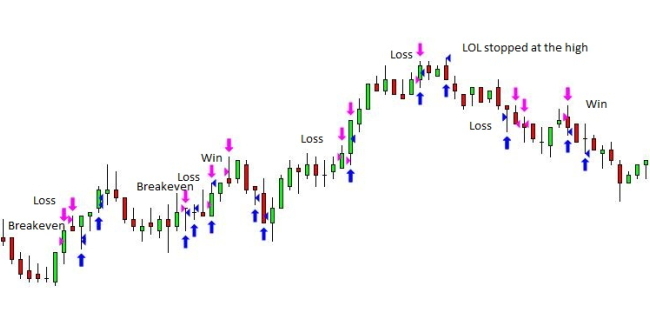 For example, visualise yourself stepping back from the charts after two underperforming trades, identifying the fact that you're fighting an obvious market bias, and implementing controls to restrict trades to the market direction only. Operate from a probability mindset. Many traders like to operate with a daily "game plan". This is absolutely fine, except when reality fails to conform to your expectations. It can be difficult to drop and amend a belief in "what should happen". To help with this, you may wish to attach a probability to any hypothesis for daily action. For example, "Analysis suggests that today the market will ____ (probability 70%)". The very act of assigning a probability, allows easier acceptance of the fact that the market may do something different. And finally, continue to monitor your charts and stats in future. This problem is unlikely to resolve itself in one attempt. Continual vigilance is required. Look back over your charts from the past three months to find any sequences of trades where you are fighting an obvious market bias. Print the chart. Quantify the damage through examining the stats. If you find it a rare occurrence, or not damaging your edge in any significant way, then that is great news. But you may just find the opposite. You may be surprised at the number of times you do get caught out, fighting against an obvious market bias. If so… this is also good news. Follow the earlier steps to understand and correct the problem. What other suggestions would you make? What have I missed? Please add your ideas to the comments section below. I wondered if this trader is also fighting uptrends (or does he prefer short trades). Fore some reason I am personally more comfortable with short trades and I only fight the market bias with uptrends. Correction to my previous message. Should be: I wondered if this trader is also fighting down trends. I’m not sure in his case. I didn’t think to ask. But it’s a great question. And it’s a whole lot more common than you might suspect (or maybe you do know). I am personally MUCH MORE COMFORTABLE short than long. I know of other professional traders who have found the same thing. I wouldn’t be surprised if this was a LONG ONLY problem. metaphorically I see the market visually like a conveyor of money flowing past, who doesn’t what to have a crack at sticking their hand in, it’s a bit like the guy in the film “Wanted” where the guy is trying to grab the weaving spool with sharp points on either end, if you grab wrong you get stabbed, that’s me trading! team or buddy trading,,, maybe less focus and more visitors, who knows ! I’ve got little to work with here, obviously. I don’t know if you’re after any suggestions. Sometimes just the act of writing all this stuff down is therapeutic in itself. Perhaps that’s all you were seeking. But just in case you were after some suggestions, let’s see if I can offer anything of value. Just to confirm I understand this right… you seem to go off the rails more when you focus… but perform reasonably well when just casually following the charts. (a) Is the issue maybe not so much the focus but rather increased pressure placed upon yourself when trading with this focus? Consider whether or not a reduction in position size will help ease some pressure. Even if you’re a discretionary trader your aim should be to systemise as much of your business as possible. Discretion can be built into decision making, but the way you achieve your decision should be standardised via documented routines or checklists. This applies pre-session, during session and post-session. My thoughts are that perhaps allowing yourself too much freedom (of decision and action) when trading live. Set up a procedural checklist / workflow diagram that takes you repeatedly through “good decision making” while you’re trading live. Discretion can be still allowed, but it’s allowed only within the constraints of your predetermined checklist. (c) Having brought up constraints… they’re a great way to address problems. Rather than adding something new, can you place some limits or constraints on what you’re already doing. Limit yourself to certain preferred environments only. Limit yourself to a max number of trades per hour. Limit yourself to 2 failed trades, before requiring a period of break from the market and a review of your decision making. Limit your trading via an indicator. For example, only in the direction of some particular short MA slope. While this type of constraint means you will not ever catch early entry into a reversal, it also means you won’t get consistently run over when fighting a market bias. And for reversals, you’ll just need to let it turn first and then seek entry on the first pullback. (d) Step back from the charts. If you’re overreacting to price action during times of great focus, do all your analysis and decision making OUT OF REACH of your keyboard and mouse. I’m serious. This can make a tremendous difference. Move your chair back. Decisions to trade will become more seriously thought out as you have to go to the extra effort of moving the chair forward first. (e) Ultimately, you might benefit from exploring systems trading rather than discretionary trading. It’s not my preferred style. But if you just cannot beat this issue of emotional reaction to price movement and to trading your expectations rather than market reality, then it might be the better style for you??? All decision making then happens during system development and ongoing monitoring and review (outside market hours). During market hours all you’re doing is letting the system do it’s thing. Something to think about. So the question is how to prevent this. I am still a bit struggling myself although I am improving. First it took me quite some effort to stick to a time-out/ recovery session at all (being too keen to ‘revenge’). Now I am sticking to having a time-out. My current challenge is to do the time-out properly. I have a procedure to ‘clear my mind’ and ‘reset’ including things like breathing and mindfulness techniques. Still I have experienced that I sometimes rush the procedure (having in the back of my mind that I need to catch the reversal I was originally thinking of). And I have noticed that it mostly happens when I am ‘optimistic’ before the session (likely seeing more reward than risk), and in combination with a strong market bias it can become a dangerous cocktail. So for me it is not a ‘quick fix’ but I am improving. I have experienced the same with keeping stops in the past. This was a challenge for me, but now I am doing this always automatically. That is an amazing response to the article. Thank you so much for sharing your thoughts. I tend to agree 100% with everything you said. In particular your comment about how an expectation for S/R to hold can lead to multiple attempts to enter a reversal, only to find you’re run over again and again and again. Expectations are fine. To some degree we have to have them, otherwise we’d find no trade opportunity. The problem occurs when we are unwilling or unable to recognise and adjust to faulty expectations. It worked sometimes in the past? Again, I agree. Prevention might not be possible. But we can limit the damage through early recognition of the problem. This then allows us to step away from the screen, clear the mind and return to reassess with a more objective assessment. I think you’re time-out process is the right way to address this. Like you say though, it’s not a quick fix. But you should see improvement. And just like the movement of stops, hopefully this eventually becomes “just something you used to do in the past”. Thanks again for your awesome feedback. Love it!!! I did go myself through this “let’s catch the Perfect Reversal” phase, and I found that in almost all of my failed trades I was not recognizing that a level that I estimated to be a resistance actually could not hold, due to the strength of the price momentum – that I was obviously assessing poorly. To keep myself out of trouble spots, I put a 10 samples simple moving average on top of the price, and committed myself to AVOID any trades that would go against that reference moving average, no matter how good the setup looked. For a couple months, I then kept a separate set of records: every time I avoided a trade in real time because of my “moving average rule”, I estimated how that trade would have performed by looking at the graph after my trading session was over. I tracked the profit/loss of such trades separately. Of course it doesn’t have to be a moving average, or 10 samples, there is no “silver bullet” – I guess what may help is: try to identify a simple condition or indicator that correlates really well with the losing situation you find yourself in consistently. Then, make a rule **set in stone** that you will NOT *ever* take a trade when that condition is present, no matter how “good” the setup looks to you otherwise. Also important to generate positive reinforcement: keep track of the results of the trades that you would have taken disregarding your rule. Oddly enough, keeping track of trades that I was not actually taking in real time helped me stick to the “no trading in this situation” rule: somehow I knew that even if I was “missing an opportunity” in that moment, those missed trades did have some kind of “purpose” anyway. This is one of the things that helped me the most to become profitable. I rarely end an article by actively asking for comments. I might have to do so more often. Because this is ABSOLUTELY BRILLIANT. I love it. I will encourage anyone who asks this question in future to follow this exact same process. I expect for most of us that the stats this would produce should PROVE WITHOUT DOUBT the value of trading with the momentum of the market, rather than fighting it. Great post. I think this is applicable to all types of trades a trader struggles with. Of course you first look if you can improve your trading and get to profitability for a certain type of entry. However if you keep struggling it does not make sense to take a ‘cherry picking’ approach for the type of trade (only taking the best ones). You have some good wins and think you will master it, but when your stats remain negative it is better to skip the type of entry altogether. And this may be not be as simple as it sound, it is still compelling to ‘pick some cherries’. I like your solution for this. Exactly right. This is definitely applicable to other types of trades. Any case where something seems so compelling, and seems to work really well sometimes (just enough to keep you coming back), but where the stats clearly show that there is no long-term edge. Just cut it from your trading altogether!